Wine is a fragile and complex balance of chemical compounds that require careful consideration for long-term storage. There are many factors wine enthusiasts should consider, however it is the wine storage temperature and how much that temperature fluctuates that have the greatest impact on the aging of the wine. Wine is susceptible to even the slightest change in storage temperature and temperature stability is even more important than the actual average temperature. Fluctuations allow more oxygen/air into the wine which is the most damaging factor to a wine’s storage life. As an expert at wine storage, we recommend that wine is kept in an environment where the temperature is stable and constant- reducing the likelihood of premature aging. What is the best temperature for storing wines? Heat is an enemy of wine and temperatures higher than 70°F (21°C) will speed up aging for wine at an undesirable rate. However, when wine is chilled too cold, it could lose its aromas and flavors. In general, wine storage temperatures depend on personal preference and the type of wine you are storing. Sweet White Wines: Champagne, Ice Wine etc. The ideal wine temperature for these sweet wines is between 41°F (5°C) and 46°F (8°C). Dry White Wines: Chardonnay, Pinot Gorgio etc. For these lighter/medium bodied wines, the ideal temperature for storage is between 46°F (8°C) and 54°F (12°C). Light to Medium Red Wines: Beaujolais, Light Zinfandels etc. Full Bodied Reds: Bordeaux, Cabernet Sauvignon etc. 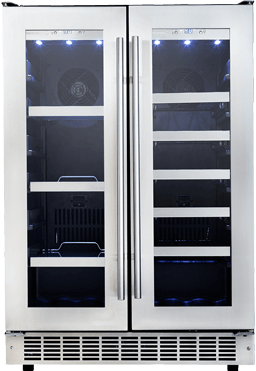 Wines can be very sensitive to their storage environment, which is why many wine connoisseurs opt for a wine fridge to help achieve proper wine storage. 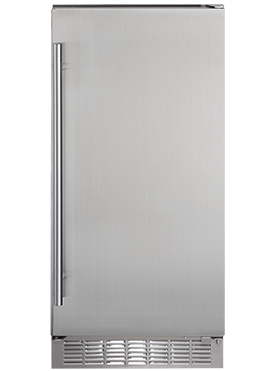 Silhouette Appliances is one of the industry leaders, of producing high-quality, and aesthetically appealing wine coolers. We offer built-in wine cooling solutions that range from 27 bottles to 129 bottle capacities. 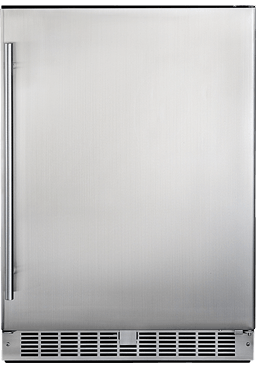 We also offer both single-zone and dual-zone temperature units. 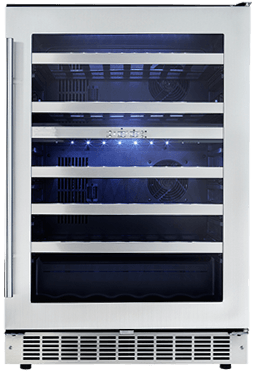 Dual-zone refrigeration allows wine lovers to store both red and white wines at their respective temperatures and humidity levels in the same unit. Whereas single zone are perfect for people who only love one type of wine.